At MC Property Maintenance, we specialise in the hire of cherry pickers across the London and the South East. Our machines are available for daily, weekly and monthly hire, and we can also offer long term options, where we will deliver to locations further afield. Our fleet comprises of a wide range of high access platforms including self-drive truck mounted, trailer mounted and narrow tracked spider lifts, as well as operated cherry pickers and spider cherry pickers for hire. 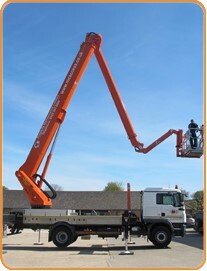 We also have a truck mounted Palfinger 480, which can reach to a height of 48 metres, with an outreach of 31 metres. • Access platforms provide a cost effective, quicker and less intrusive alternative to scaffolding. • They provide high access for all external and internal maintenance and cleaning. • Great for gutter cleaning, wiring work, installation of gas flues, tree surgery and UPVC window cleaning. • They are an ideal choice for construction sites, warehouses and factories as well as churches, cathedrals and shopping centres. 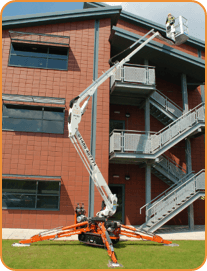 Why hire a cherry picker from us? 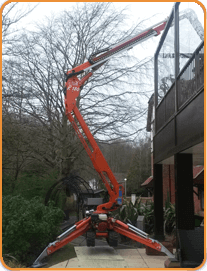 If it can be reached by a cherry picker, MC Property Maintenance can supply it. 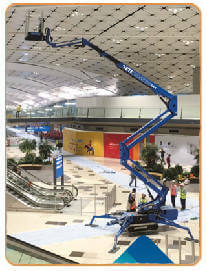 • Our rental fleet includes the most versatile access platforms currently available in the market place. • We can provide easy access to hard-to-reach areas. • For operated hire we deliver to site, set up and help you complete your task in a professional manner. • For self-hire we deliver to site on your chosen date and provide a comprehensive handover. If you require a high-level access platform, please use the table below to compare our fleet options and click any of the images for machine specifications. Once you have found the best cherry picker for your needs please call us on 01243 530076 or complete the enquiry form at the bottom of this page for availability and our best prices. What raise and reach do I need? Determining your required raise and reach is one of the most important steps in making sure you choose the right cherry picker for your project. If you underestimate the measurements then you may not be able to complete the job, or risk injuring yourself in doing so; overestimate it and you could end up paying too much for a bigger machine that you don’t need. Our cherry picker height is measured from the ground and includes the height of an average person. Similarly, the reach is calculated using the width of the bucket and the average reach of an adult. If you are taller or shorter than most people, or intend to be working with heavy equipment that cannot be used with a fully-outstretched arm, keep this in mind when choosing your cherry picker from the table. 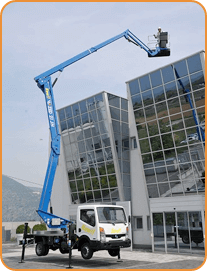 What do I need to consider for using a cherry picker outside? 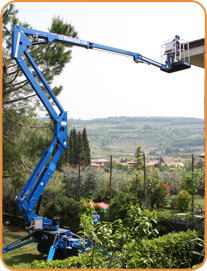 The most important thing to consider when choosing an outdoor cherry picker is the ground quality and overhead space. If the earth is going to be boggy or sloped then make sure you choose a model with an outrigger or suitable gradient stability. Overhead cables, branches or other structures may also dictate the type of movement you require from your machine. If you have any concerns, call us on 01243 530076 for advice. What do I need to consider for using a cherry picker inside? Do you have enough ventilation indoors to use a diesel vehicle, or will you need an electric one? What is the narrowest gap your cherry picker will need to pass through? Once in position, is there enough space to manoeuvre the vehicle? Filtering your options by fuel type, size and tuning radius will help you find the most appropriate cherry picker for indoor projects. Can anyone use a cherry picker? A full, valid driving license is required to operate heavy machinery, including cherry pickers, weighing up to 3.5 tonnes, however any equipment heavier than this will require additional training. If you only need to rent one of our smaller machines, or already have the appropriate license, then you can read more about our self-hire options here. All our self-hire machines are delivered by an experienced member of staff, who will help you become familiar with the machine. Do you provide staff to operate the cherry pickers? Yes. If you would prefer your cherry picker to be manned by a professional, or you do not hold the appropriate license to operate the machine you require, speak to us about the availability of our experienced operators. Our operated services are ideal for both domestic and commercial clients, and prove particularly cost-effective for longer-term projects which would benefit from the assistance from a member of our skilled team. MC Property Maintenance offers dedicated cleaning and decorating services, or our staff can assist with a specific project you have in mind. If you need any assistance in choosing the best machine for your requirements, contact us or view our essential guide to choosing a cherry picker. 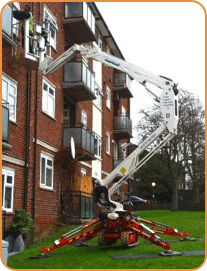 MC Property Maintenance offer our Cherry Picker hire services to clients across all the boroughs in London as well as the whole of the South East of England, covering a wide range of areas in order to ensure complete satisfaction in our clients. 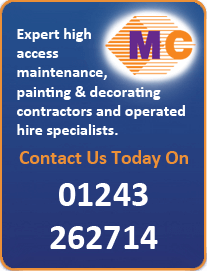 With a variety of different operated services for hire, self-hire vehicles and property maintenance services available, MC Property Maintenance are able to offer our services to clients across the whole of the South East.